“Three days after my first TEDx talk in the Netherlands I discovered I had moved up 31 places on the world men’s skeleton rankings according to the International Bobsleigh and Skeleton Federation (IBSF) standings released in the last quarter of January 2019,” exclaimed an excited Akwasi Frimpong to TheAfricanDream.net in an interview. “31 places up, man this by far is my biggest climb on the IBSF men’s skeleton table, I must tell you how thankful I am to my management team,” Akwasi said. 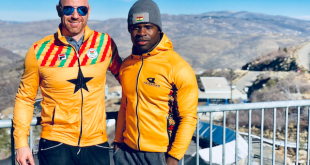 He continued saying “special thanks to Zach Lund who is Head Performance Director of the Bobsled and Skeleton Federation of Ghana (BSF – Ghana), Dr. Vernon Darko the BSF – Ghana President, and my fans all over Africa and the world,” said Ghana and Africa’s first male skeleton athlete at the 2018 Winter Olympics. This feat now places the Olympian 68th on the IBSF table overall 112 which is quite impressive considering the fact that he beat out other male skeleton athletes from countries with an abundance of snow in winter. Ironically, Ghana and most of Africa has no snow. When TheAfricanDream.net asked how he attained this result, the men’s skeleton athlete attributed it to loads of hard work, dedication and a great team. 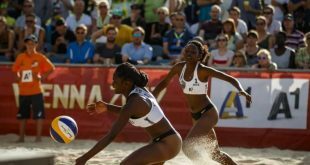 Whether you want to be a lawyer, a doctor, a carpenter, or an Olympian — anything is possible if you work harder and believe in your dreams Akwasi said. The athlete has reached a mutual agreement with his coach Zach Lund this year to not head to the skeleton world championships. To become a part of Akwasi’s ‘Hope of a Billion’ project, sponsor his Winter Olympics dream or find out more about what he is up to, visit frimpong.com.